Before I get started with disc two, I’ll just bring up an interesting note about the album’s history: In the time leading up to the release of Mellon Collie and the Infinite Sadness, Billy Corgan famously compared it to Pink Floyd’s double-length masterpiece The Wall, released in 1979. That album itself became an essential listen for teenagers of its era, with its insanely ambitious production and story-driven lyrics about a troubled, mentally scarred rock star. 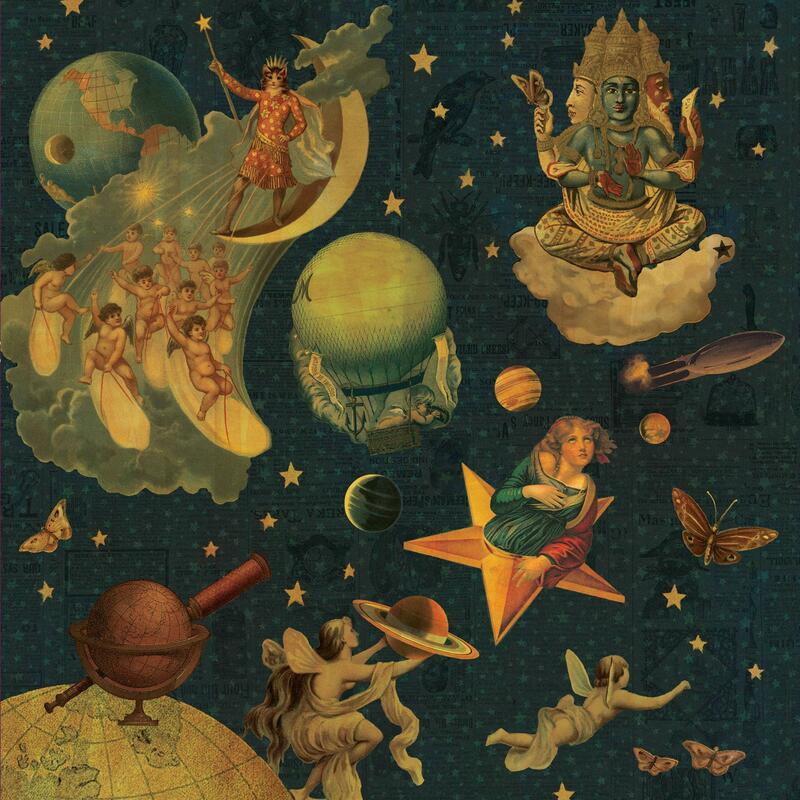 Mellon Collie, while not exactly aiming to tell an obvious story, definitely carries on its predecessor’s fondness for sheer scale and overblown theatrics, which I guess goes to show that the young generations’ tastes in pop culture don’t really change. If that wasn’t enough proof for me to say that, 2011 saw the release of Hurry Up, We’re Dreaming by M83, yet another two-disc epic that saw the French electronic group reaching new levels of success and devotion in very much the same way those two previous works did for their respective bands. Sure enough, frontman Anthony Gonzalez cited Mellon Collie as his main inspiration. So there is a clear line to be traced across these remarkable albums, all aiming higher than everyone else in their time, spanning two discs and being released almost exactly 16 years apart. This was actually brought to my attention by the questionable minds at Pitchfork Media, of all places, whose review of the reissue of Mellon Collie is actually really well done. Maybe in 2027, another act will take the torch and make the same big leap the youth will desperately need. Anyways, disc two, intentionally or not, has a very different feel from disc one. The lyrics are generally less direct, the energetic anthems are all but dropped and the tightness of the band performances is downplayed with both rougher, sludgier recording and electronically influenced arrangements. The distinct digital production, another important factor that sets the album apart from Siamese Dream, is further emphasized by these different sounds. The opening one-two punch of “Where the Boys Fear to Tread” (probably the weakest song on the album) and “Bodies” sets the tone for a generally darker, moonlit second hour, with hyperactive madness in place of blind optimism. But sure enough, we’re faced with another complete tonal shift as “Thirty-Three” politely comes in. The arrangement is a lovely, genuinely quirky combination of graceful piano, country-esque guitars and an understated drum machine; it seems to have foreshadowed today’s dinky indie-pop sound. Far more gentle than most of the previous tracks, “Thirty-Three” is the first in a perfect trio that features some of the only truly adult themes on the album. The lyrics are poetic reflections on Billy’s troubled marriage at the time, as are those of the follow-up “In the Arms of Sleep”, a dreamy, quietly longing ramble of a tune rich with enchanting twangy guitar work. And then, of course, there’s “1979”. A sentimental, vague recollection of Billy’s youth, this song is something of an inversion of Mellon Collie’s style, from recapturing those years of his life to looking back fondly on them. The magic is in the arrangement once again; it’s as though the entire backing track is a great big rush of childlike wonder coming back to you. In every detail this is probably the best example of a nostalgic anthem ever recorded. It’s only fitting that it ended up being the album’s biggest, most fondly remembered hit. “Tales of a Scorched Earth”, the very next track, sounds like anything but a hit. It’s insanely manic and totally over-the top, taking the metallic sludginess of “Bodies” and “An Ode to No One” to its greatest extreme. The music and vocals are barely even discernible! That little bout of insanity is followed by “Thru the Eyes of Ruby”, a dark epic that somehow matches the sheer scope of “Porcelina” and mirrors it in tone. Billy returns to full angst mode here, but his lyrics and vocals manage the amazing achievement of making the youthful venom sound as seductive as it did in high school. As for the collective band performance, I believe it’s as good as anything the Pumpkins have ever done. The ambitious dynamics are pulled off to perfection, resulting in a dramatic whirlpool of guitars and charging drums. Jimmy Chamberlain’s jazzy, pounding drum work is particularly highlighted. For a gripping seven minutes, the album descends into its own world of irresistible darkness to reach an electrifying climax. Anyways, the song is a masterpiece. And that odd coda happens to lead quite nicely into “Stumbleine”, the album’s gentlest and most intimate track, played only on an acoustic guitar. Billy’s hushed vocals and delicate picking convey a romantic nighttime atmosphere that ends up dominating the rest of the disc, hence the name Twilight to Starlight. But not before the big mother of a song “X.Y.U.” charges in and threatens to throw the whole thing off the rails. Another lengthy epic, this time 7 minutes long, it’s not unlike the out-of-control jam “Silverfuck” from Siamese Dream, except with brutally straightforward fury in place of that track’s wildly irregular dynamics. The vocals and lyrics are completely bizarre; Billy hisses, grunts and screams incoherently for nearly the whole time, like the singing equivalent of a Nicolas Cage performance. Why does he launch into a demented riff on “Mary Had a Little Lamb” during the first breakdown? When will this lunacy end? What is even happening?? Well. Thank goodness the rest of the album chills out, and I mean really chills out. Clearly, there’s no better way to follow that musical firestorm than with “We Only Come Out at Night”, a tongue-in-cheek campfire song for the outsider in us all, played on a zither of all things (look it up, it’s a real instrument). “Beautiful” is more unusual still, featuring looping electronic sounds and duet vocals from bass guitarist D’arcy Wretzky. Her sweet performance and the sensual arrangement do a better job of capturing teenage romantic longing than the actual songwriting does, and the track feels shallow as a result. Still, even though Billy himself mentioned this reservation in the liner notes for Mellon Collie’s reissue (which are great, by the way), I think there’s something revealing and oddly touching about the superficial expression behind “Beautiful”. Awkward, faded beauty is still beauty after all. “Lily (My One and Only)” is a lighthearted detour, clearly informed by The Beatles’ self-titled album. It’s pretty slight, but it adds still greater variety to the album as a whole. The lyrics, funnily enough, are about a young Billy spying on a former crush through a window! “By Starlight” features a jaw-dropping fade-in, surely the album’s most gorgeous moment in terms of pure production. The rest of it, jazzy and downcast, is nearly as stunning in its heavenly atmosphere. It’s the last moment of dark romanticism in a double album full of just that, not to mention one of the best. Finally, James Iha delivers the closing sentiment with another Beatles tribute, “Farewell and Goodnight”. The odd but sweet lyrics are sung in turns by all four band members (even Jimmy!) before they sing the final refrains together in a stirring display of unity. There was simply no better way to close this epic journey than with this very literal lullaby, a moment so comforting and kind as to make you feel you’ll never need to hear anything else in your life. Oh, and it ends with a reprise of the title track, bringing everything full circle. Pretty cool, right? So… Mellon Collie and the Infinite Sadness. I think I’ve said enough. And yet I feel like I could keep going forever, such is its greatness and sentimental value. If I had been 16 going on 17 in 1995, a year when double albums, ambition and Beatles tributes were practically uncool, I’m sure I would’ve embraced it just as much as I did in 2012. Its appeal is timeless and utterly sincere, presenting a little universe of brilliant tunes and sonic wonders for anyone willing or desperate to get lost in it. And boy, does writing about it bring back a lot of feelings and memories. Even though I didn’t dwell so much on those things, I avoided that knowing the album and its songs could represent different, equally special experiences for other people blessed with them. For me, it was the Christmas guitar concert of 2013… the cheerleader I could never approach… grad night… the drama of my senior year. Through it all, the Smashing Pumpkins were there when no other band was, just as they always will be for me and everyone else who wants their own small, personal moments like those to feel truly special. (Mellon Collie and the Infinite Sadness is a really special album, for Danny, myself, and many others, and so we associate many memories with it. Danny said his, but I, RADDman, will share a few of my own real quick. I watched our other brother and his band stun a crowd with a performance of “1979” in a dimly-lit high school cafeteria. “Tonight, Tonight” reminds me of standing on the cliffs of Tintagel in Cornwall, feeling the wind and ancient energy of the place and believing I could do anything. And sometimes, I get in foul moods where overdramatic lines like “I know the silence of the world” resonate fully.